Looking for competitively priced home loans & mortgages in Redding, CA? Looking to refinance? I’m here to help. Contact Mortgage Matt at Megastar Financial Redding to get started with your home loan! My name is Matthew Brown and I’m the branch manager of Megastar Financial Redding. If you’re looking for a knowledgeable, conscientious loan officer to help you find the best home loans in the Redding area, or to help you refinance a loan or mortgage, contact me using the form below. Interest rates are fixed for a time-frame of 10, 15, 20, 25 or 30 years. Principal and Interest payment for this home loan is set for the entire term and will never change. Also, your interest rate will never change. A conventional loan is not guaranteed nor insured by an outside entity. Because fewer low-income buyers use these, conventional loans typically have very attractive interest rates. Furthermore, unlike FHA loans, there are no mortgage insurance premiums to worry about. Depending on your situation, a conventional loan or conventional refinance may be the best option for you. A USDA loan was designed by the US Department of Agriculture to improve life in rural areas. These no-money-down loans can be a great option for those eligible, but many people don’t know these loans exist. Allows for 100% financing on homes in eligible areas determined by the USDA Rural Development. More favorable income and credit qualifications may apply. There are some income limitations that must be met for USDA loans. A VA (Veteran’s Administration) loan can be an incredible option, if you’re qualified for it. They are available to eligible current or former members of the U.S. Armed Forces and their surviving spouses. Very competitive low fixed or adjustable rates. More favorable income, debt, and credit qualifications than other home loans. An FHA loan is insured by the Federal Housing Administration. Buyers pay for mortgage insurance to protect the lender in the case of a default. This means you can get your home at lower interest rates with fewer qualifications. Purchase your home with as little as 3.5% down. Seller can contribute up to 6% of sales price to help with closing costs. Choose from a fixed or adjustable-rate mortgage. Do you want to buy a home? Who do you call first? 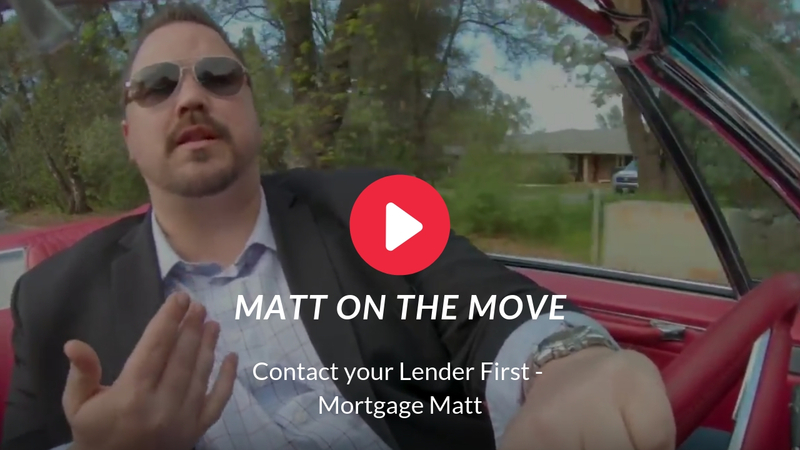 In this video Mortgage Matt talks about who you should talk to first and why.